These last few weeks it has been incredibly high paced. The day trips for material, the time in the studio being pretty much 7 days a week and all hours, the show itself and, finally, getting back into society after spending the last couple of months working so intensely. Needless to say I am exhausted! So this past Sunday, my husband and I decided to go to Victoria Falls on the Black River to get away for a few hours. The road to get there is very rough and more suited to ATV’s than even a truck – and it was no surprise that we saw mostly ATV’s on it! Normally, at this time of year, the river is but a trickle and sitting in the falls and letting the water wash over you is better than any spa. This year it is running like as if it were spring run-off! The water boiled and bubbled and we had to walk quite a ways down the side of the river to find a break in the rapids. When we finally found a quiet bend in the river, we were hot and got straight into the water. The rapids were off to the side, but still there was a good current that had created a sandbar. I haven’t had much time for reflection these days and, as much I am not ready for the cool Autumn days to come, I am looking forward to a quieter pace and time to think. I like the metaphor that Life is like this river. When you get yourself in the right spot, the current picks you up and sweeps you down rapids and then slowly through meandering bends. The pace changes and it is easy to get stuck on the bank if you don’t stay present. 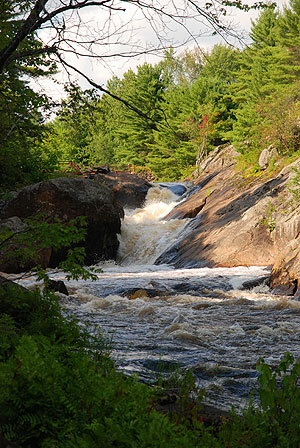 Fear of the rapids or simply getting stuck can remove you from that flowing life force. It takes a great deal of effort to get back in the current and a great deal of courage to let go. Sometimes it just takes the right thing, event, or even realization to put us back in that river. Somehow, in the process, we become more conscious and the ride is a heck of a lot more fun. Today, the exhibition closes and the preparation of the last 10 months comes to an end. I look forward to the next part of the journey – the crickets, the summer, more paintings – the Moment…. I am a little late in posting this – but I wanted to say a big THANK YOU to Kim at Laketrees for awarding Artscapes with the Creative Artist Award. 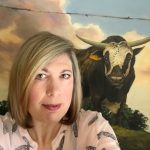 I am deeply honoured and am proud to share it with the wonderful list of talent brought together in the blogosphere by Kim’s constant efforts…. Congrats on the award! I want to go sit in that waterfall. It’s funny, people are posting about the impending Autumn, talking about the coming cool, etc. Down here it means temps are just returning to comfortable from unbearably hot & humid. I’m totally looking forward to it! 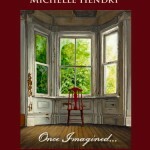 that painting is marvellous Michelle!! the use of light and shade is wonderful..
the photo of the falls is beautiful and I enjoyed reading your thoughts on the days to come…lovely..
As always I love the painting. There is a simplicity about your work that is truly elegant. Hope you have plenty of time for reflection; your words about it are inspiring and after all those beautiful paintings you deserve it! Enjoy the summer; its almost over. I see the signs everwhere. 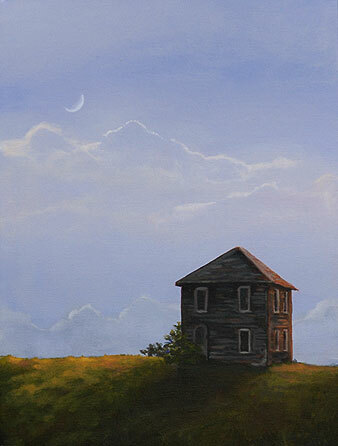 Love the elegant little moon in your painting. Lana – I think I would greet Autumn with open arms if I lived down there as well! kk – Yes I think I will really enjoy some down time…. Thanks! Your art is SO beautiful. It really tugged at my heart and old memories (good) for me as I grew up in Maine. 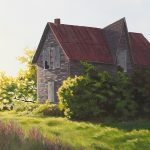 These paintings look like so many old barns and houses there. I also love the way you paint the tall grass bending in the wind. I’ve seen grass like that thousand times as a kid and I could almost hear it…from years of walking through tall grass fields filled with daisies and buttercups. Your work is very emotional and of course utterly beautiful. You are truly gifted. Thanks J – but one is actually a painting! What a gorgeous shot of the falls! Lovely reflections on your time there. I hope your pace can slow down for a bit to let you revive! Congratulations on the Creative Artist Award! Very well deserved! Congratulations on the award Michelle…I love Kim’s idea for giving this award…so very personal!! As with other paintings this one feels calm, relaxing, maybe it is the simplicity of your work…it is wonderful regardless! The falls photo is stunning…a perfect spot to relax. I relate to your metaphor regarding the falls and river…so very true. Take your much needed time to relax and enjoy the Moment! !